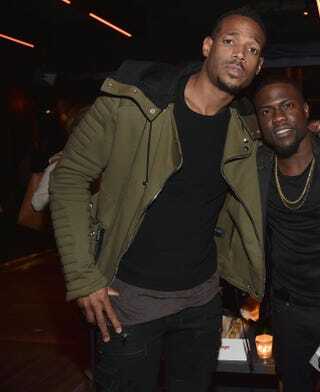 Marlon Wayans and Kevin Hart at the after-party for the premiere of Hart’s The Wedding Ringer Jan. 6, 2015, in Hollywood, Calif.
Not everyone is a fan of Kevin Hart's or Marlon Wayans' movies, and one critic on Twitter told the actors what her issues were. "When are black celebs like @KevinHart4real & @MarlonWayans gonna stop doing stereotypical movies?" @tashyonlaneigh asked. The question must have touched a nerve with Hart, because he immediately responded. Wayans also jumped in on the tweets and voiced his opinion about whether he's a stereotype, but seemed to have missed the point. Here's the thing—not every movie is for everybody. But that doesn't mean there wasn't some truth to @tashyonlaneigh's question. It seems as though when it comes to black comedies, there's only one type of formula, and Hart and Wayans seem to have mastered it.